Folding laptop stand is an ideal cost effective gift for the employees, consumers and associates. The biggest advantage is that you can fold it to smaller then a scale size, light weight and carry with you. The recipient will love to receive it, use it and remember you and your brand for considering it to give as Corporate gift or promotional giveaways. 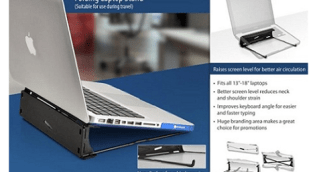 What is a Foldable Laptop Stand? As the name suggest the device is foldable stand tilted for ease of use on laptop of any size and helps you in reducing strains in spite of long use. We all have got use to the laptops but the challenge is that the screen level is lower than required and even air circulation speed is not enough to cool down the device. We assure you that use once and you will get hooked to it by buying another one for home use which you can even carry while travelling. The best gift item is one where your important customers call you requesting for another one for their use. Foldable laptop stand which will fold to a size of scale for smaller or larger screens. Non slippery and will make air circulation easy due to better screen level angle resulting in perfect typing with reduced neck and shoulder discomfort. Available Price Range at Sparket.. The MRP of the product is Rs.150 but on bulk buying it will be offered at an attractive price depending on the exact branding, customized packaging and quantities.